Are 120mm fans just not cutting it anymore? Do you need the biggest, baddest fan around? 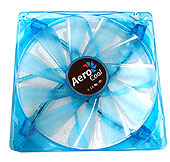 Then you need the new AeroCool Streamliner 140mm fan. That's right, 140mm. This huge fan stretches a whopping 14 centimeters across, yet will still fit any 120mm fan holes thanks to a convenient 140mm to 120mm adapter. The Streamliner, due to its large size, flows a whopping 54.7 cubic feet of air per minute, despite turning at only 1000 rpm. To top it all off, the Streamliner is lit by super-bright blue LEDs.